Nov 5th, 2019: We are now accepting applications for September 2019! Please e-mail speed.leblanc@gmail.com for the application and/or more information. WHAT IS THE HP PROGRAM? Many Publically Funded Schools are now offering this program. Click Below for the links to each school’s webpage. At S.P.E.E.D. every athlete is assessed for their on-ice and off-ice strengths and weaknesses. Then we set goals. The results of this determines the athletes program! 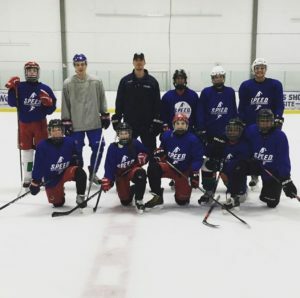 THAT’S RIGHT, we have different athletes doing different skating, shooting, stickhandling, game-play and off-ice programs to complement what they need for their own development! A Concept that seems lost in the hockey world that we take very seriously. Step 1: Contacting our Program Coordinator to Receive the Application. You can contact Ray LeBlanc by emailing speed.leblanc@gmail.com. A discussion with Ray will help you ensure our program is right for you, as well as help you understand any details you are unsure of before applying. Step 2: Apply directly to the school(s)’ program. (You can find application information on the school’s websites which are linked above). PLEASE NOTE: There is an Application Deadline every School! Step 3: Come for a FREE Trial of our program at SPEED, and a follow up meeting to discuss more details about your application with us.